As we head into the holidays, we are hard at work planning for the 2019 season! To get you thinking about Camp Promise, we wanted to focus this month on our staff ratios and why they play a huge role in the success of our program and happiness of our campers. What is a Staff Ratio and why is it important? When choosing a camp that’s best for you, you’ll probably hear a lot about the counselor-to-camper ratio, aka the “staff ratio.” These ratios are often a measure of supervision and safety, and in the camp world, they can give you an idea of how much attention and focus both campers and counselors will receive. Technically speaking, these ratios are a pair of numbers, a fraction, that identifies how many staff a camp has per camper. The lower the ratio, the fewer the staff there are per camper, whereas a higher ratio indicates there are more staff per camper at camp. What is Camp Promise’s Staff Ratio? Camp Promise has a high 1:1 ratio which means that we have one counselor for each camper enrolled. For campers, this means they will have their very own counselor for all of camp, and for counselors, this means they will be paired up with the same camper for the entirety of the camp session. Staff ratios can be a measure of how much attention a camper will receive. With small ratios, the individual focus disappears and campers can feel left out or detached. 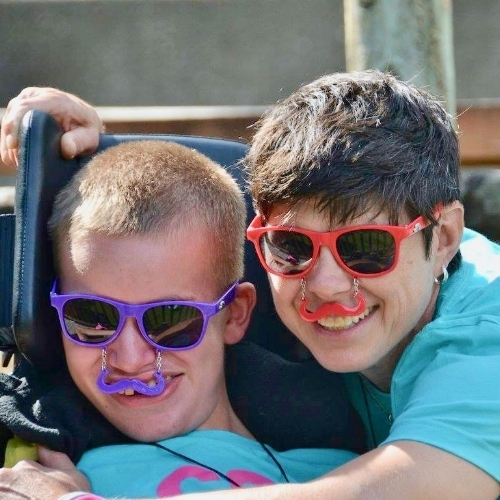 However, with a high ratio like ours, we’re able to create strong bonds between campers and staff, quickly and accurately attend to campers’ specific needs, and make sure all campers get proper attention and individualized care throughout the week. A built-in buddy. Campers won’t have to worry about who to sit with at lunch time, or how they’ll get their food. Not only do counselor help with all of their camper’s physical needs, but they are also responsible for being a friend, a partner, a coach, and a mentor all week long whose sole purpose is to prioritize their camper’s experience. #makehappycampers. Less homesickness. A lot of attention can go a long way. Our high ratio means there are always counselors around to care for campers. This attention helps campers adjust to camp life, encourages participation and keeps homesickness to a minimum. Less waiting. Campers won’t have to wait for someone to help lift or transfer them, take them to the bathroom, get changed for the pool, etc. With their own counselor, they’ll have someone around at all times to help with all of their personal care. Flexibility. With more staff on site, we can tailor the camp experience to each camper so campers spend more time doing the things they enjoy and less time doing the things they don’t like. For example, if a camper doesn’t like Arts and Crafts (gasp! ), they won’t have to get stuck there with the rest of their cabin and can instead go with their counselor to a different activity. Smooth personal care routines. Because each camper works with the same counselor for the whole week, they will get to know their counselor well, and the counselor will get to learn their camper’s routines and preferences. With each day packed chock full with fun activities, having a smooth morning and night routine can make all the difference! You’re never alone.With so many other counselors in your cabin and staff around camp, there will always be someone to whom you can go and ask for help. You'll form a deep bond with your camper. Since you'll be working with the same camper for the whole week, you'll get to know them, their interests, and their personal care really well. They will be your priority and you will learn to anticipate their individual needs and preferences. This will make for a more enriching experience for both of you! You’ve got a team behind you. Yes, we’re a 1:1 camp, but that doesn’t mean you have to do everything on your own with your camper. Each cabin takes a team approach and you will get to know all of the other campers and counselors in your cabin. Experienced resources. Cabins have a mix of new and returning counselors so if you’re not sure how to do something, there’s bound to be veteran counselor around who can help you out. Additionally, each cabin has a Unit Leader (UL) who has been at camp before and who has a lot of personal care experience-- they will be one of your greatest resources. How we do our counselor-camper pairings is a whole ‘nother topic, but suffice it to say that we interview both counselors and campers as part of the application process. We ask both parties about their preferences and interests and we go from there. These pairings don’t change during a given week of camp, and while there are a few “forever pairs” over the years, a camper’s counselor may change from year to year. So, whether you're attending camp as a camper or as a staff, we want you to feel safe as at Camp Promise. We hand select the best counselors and staff, and put a ton of thought into building our teams and making sure we have just the right numbers. We’ve developed a system that works best for ours and your specific needs, and that includes our volunteers, our campers, and the parents of the campers we serve. These guidelines help us create an intentional environment where everyone can succeed and have an unforgettable summer at Camp Promise! While it's true we have a 1:1 counselor-to-camper ratio, our overall staff-to-camper ratio is actually much higher and ranges from 1.5-1.75 staff members per camper. This is because, in addition to all of our one-on-one counselors, we have float counselors as well as program, logistics, and medical staff on site. So, while our counselor-to-camper ratio may be 1:1, our overall staff ratio tends to be even higher. And, all of these added staff mean there are even more eyes on our campers so that we can pay more attention to everyone’s safety, health, and fun!